S Fear Electrical & Mechanical Services Ltd’s magnetic platen systems are currently the most comprehensive answer to the growing requirement of JIT (just in time), SMED (single minute die exchange) in all advanced manufacturing processes facing smaller batch runs and wider product ranges. A magnetically clamped mould of any size, large or small, is held flat against the machine eliminating any mechanical clamping stress or deformation due to the force being applied to the entire surface area of the mould and not just around the peripheral area as in traditional mechanical or hydraulic methods. The combination of mould/magnetic module/machine platen becomes a perfect match and guarantees superior operating conditions. The absence of deflections in the mould and machine platens translates to better quality and repeatability of the moulded parts. Automotive, home appliances, lighting, packaging, electronics, connectors, fittings, furniture, health care and many other industries are already successfully using our supplied Magnetic platen systems on machines of any size and tonnage. Competitive price combined with the high R.O.I. of the system justifies the investment within a few months of use. The magnetic platen systems can be easily and quickly installed on any press by bolting the magnetic modules to the slots or hole pattern present on the machine platens without any modification. The company can also run through your machines Euromap system or your standard emergency stop circuit. 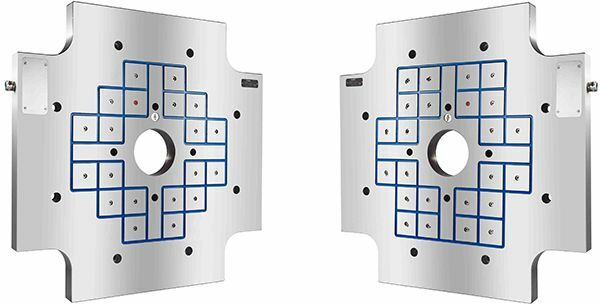 A single mould setter, without special skills, can perform the mould change standing safely outside the machine and away from the mould during its handling phase. The platens prevent any damage from occurring to the machine platens, eliminates the need to repair damaged holes or surfaces increasing the productivity of each machine it is installed on. With no moving or wearable parts, the system will retain its value for years to come. The implementation of the “Just in Time” manufacturing process translates into sharp reduction of inventory with the optimization of the floor space, handling costs and time. The absence of any oils or lubricants makes the platens the ideal solution for the production of uncontaminated parts in a clean room environment. The quality of clamping with rapid mould changes, that helps to keep the working temperature, enhances the productivity of the machine, generates a significant reduction of non-conforming parts. The only investment is the initial one. No cost for bolts, nuts, clamps or dedicated tools and no more problems with maintenance of these with any oils or lubricants. No maintenance of the system modules and platens. No loss of production. Related Post Should Aluminium be Considered as a Tooling Material?